Freeze branding is the process of using a branding iron to freeze a mark on the hide of an animal. Freeze branding uses extreme cold to kill the cells in the animal's skin that produce pigmentation, or color. Therefore, a freeze branded animal will have white hair where the freeze branding iron touched the skin. 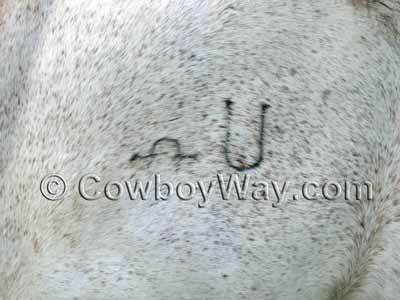 Freeze branding a horse (or other animal) is permanent, and is done for identification purposes. We have a related page on this site showing photos of the freeze branding process on horses. You can see it here: Freeze Branding Horses. The white hairs of a freeze brand stand out in sharp contrast to the darker hairs surrounding the brand, making a freeze brand extremely noticeable both to people who are familiar with livestock and to those who are not. Simply put, many more people are likely to notice a freeze brand than a hot brand, and for this reason alone many people consider a freeze brand a superior choice for identifying horses, cattle, and other animals. This identification works not only as a theft deterrent, but has also helped animals get returned to their rightful owners after they have accidentally gotten loose or after natural disasters. Below: A horse with a freeze branded "Mill Iron U." 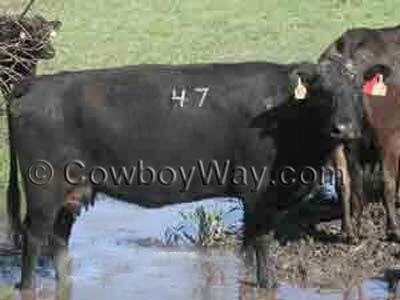 Below: A cow with a freeze branded "47." Another distinct advantage of freeze branding is that a freeze brand remains clearly visible and easy to read even in wintertime, when many hot brands (which are not as easily seen as a freeze brand at any time of year) are made nearly illegible by a long winter hair coat. Lastly, freeze branding has the distinct advantage of being painless or nearly painless to the animal during the branding process. Freeze Branding Horses: What If I Have A White, Gray, Or Light-Colored Horse? The white hairs produced by a freeze brand are not all that helpful on a horse that is white, gray, or some other light color. There simply isn't enough contrast between the white hairs of the freeze brand and the surrounding light colored hairs to make the freeze brand stand out. In this situation horse owners will still commonly freeze brand a horse, but they will apply the iron to the horse's skin for a longer time period than usual, intentionally stopping future hair growth. The result is a brand that looks similar to a hot brand but that is often clearer and more easily read, and that was also more pain-free to apply. Below: A gray horse with a brand that looks like it was put on with a hot branding iron. However, it is actually a freeze brand where the branding iron was intentionally applied to the skin long enough to stop all hair growth. What Animals Are Commonly Freeze Branded? Horses and cattle are commonly freeze branded. Other animals are also freeze branded, including dogs. How Is Freeze Branding Done? As we have said, a freeze brand is the result of applying a very cold branding iron to the hide of an animal. The three most common coolants used to make a freeze branding iron very cold are: 1) A combination of dry ice and 99% alcohol, or 2) A combination of dry ice and acetone, or 3) Liquid nitrogen. A branding iron made specifically for freeze branding is made of different metal(s) than a "hot" branding iron so that it will retain the cold from the coolant more efficiently. A horse (or any animal) that is going to have a freeze brand applied will need to have the hair shaved off of the branding site. Hair is an excellent insulator and needs to be removed so that the extreme cold of the freeze branding iron can be applied directly to the skin. After the area is shaved, the freeze branding iron is submerged into the coolant. Immediately before the freeze branding iron is ready to be applied the animal's skin is soaked with a generous amount of 99% alcohol, then the freeze branding iron is removed from the coolant and held onto the skin with firm pressure for several seconds. The exact amount of time the freeze branding iron will be held on the skin varies according to the kind of animal, its age, the type of metal the branding iron is made of, the type of coolant being used, and other factors. Approximately three months after being freeze branded, the hair should grow back in at the branding site a nice, bright white. 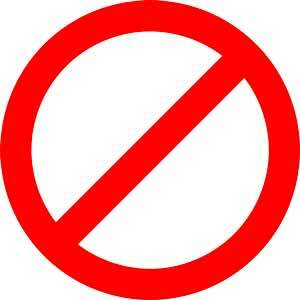 When designing your brand, try to keep any letters and symbols you are using as open as possible. For example, the letters "H" and "L" are far more open than letters like "B" and "R" with their small, enclosed areas. The more open a symbol or letter is the more likely it is the brand will show up clearly and be easily readable. Avoiding small, enclosed areas with a freeze brand design is not as important as when designing a hot brand, however, as freeze brands are more tolerant of small areas. When designing your freeze brand become a keen observer of other people's freeze brands to see what did and did not turn out clearly, and ask for advice from people experienced with applying freeze brands.